Communication problems are very common among couples seeking help for their relationship. Frequent arguments, fear of touching off a fight, heated exchanges, and avoidance of issues are all common complaints among couples I work with. Communication problems can be confusing and discouraging but there is a way out of the fog. There are positive adjustments that couples can make in how they respond to each other that can make a big difference to their relationship. According to research by Dr. John Gottman, one of the foremost experts on what makes marriage work, happy and healthy couples demonstrate an optimal ratio of 5:1 positive to negative behaviors in their relationship. In other words, when happy couples communicate, there are five times as many positive interactions between them (i.e. listening, validating the other person, using soft words, expressing appreciation, affirmation, physical affection, compliments, etc.) as there are negative (i.e. raising one’s voice, stating a complaint, or expressing one’s anger). By contrast, among couples on the path toward divorce, this ratio is just under one to one. For every negative interaction there is less than one positive interaction. One way to improve the quality of your communication is to increase the amount of positive behaviors in your relationship and to decrease the amount of negatives. Reflect for a minute on what ratio characterizes your conflicts. Is there respect? Is there kindness? Do you genuinely listen to each other? Do you soften your tone with each other? Are your intentions helpful and positive? Over the past twenty-plus years Dr. Gottman has conducted an exhaustive and thorough study of married couples, seeking to understand what distinguishes couples who divorce from couples who create strong and vibrant relationships. Much of Gottman's earlier work, summarized in his first book What Makes Marriage Succeed or Fail?, highlighted the relationship between marital stability and how couples handle conflict with each other. His more recent work, summarized in his book The Seven Principles for Making Marriage Work integrates his later findings about the importance of friendship and fondness as the primary factors that predict the health of a marriage. In other words, how spouses are with each other when they are not fighting is a telling measure of how they are with each other when they do fight and of the long-term viability of their relationship. For purposes of our discussion about conflict and communication, however, let me outline some of Dr. Gottman's predictors of divorce that have to do with how couples communicate with each other about difficult issues. Imagine starting off a discussion with your spouse about an issue that upsets you. If you are feeling frustrated and resentful your first uttered words might be harsh, sarcastic or critical. For example, "The trouble with you is ...," or "Why do you always have to be so selfish?" or "My problem with you is that you never ...." Notice the accusing and hostile tone of these words. Imagine the body language associated with the tone. This is what is called a harsh startup, meaning how you "started" discussing the issue was severe, sharp or accusing. According to Gottman, ninety-six percent of the time a harsh startup predicts how the argument will end—negatively and without resolution. Once an argument starts off in a negative direction, it very rarely "rights" itself. Harsh start-ups are strongly associated with divorce and relationship break-up. These are four hostile forms of communication that put couples at high risk for divorce when these patterns take up permanent residence in the relationship. Criticism is defined as blaming, faultfinding, or using global and negative labels to attack your partner's character. For example, "How would you know? You're never home," or "My problem with you is ...." A harsh startup often comes in the form of criticism. Contempt is a lack of respect for your partner’s dignity, an attitude of looking down on your partner as unworthy. Forms of contempt include name-calling, put-downs, sarcasm, cynicism, swearing at each other, rolling of the eyes, mockery or hostile humor. Contempt is demeaning and conveys not just disapproval of your partner's behavior, but disgust with who your partner is. While the other three horsemen show up in small amounts in most marriages, contempt is only found in toxic relationships. This horseman also includes belligerance, which is an aggressive and angry provocation or threat. Defensiveness is a way of turning back a perceived attack. Someone who is defensive denies their partner’s statements, refuses to admit their role in problems, avoids responsibility for how they impact their partner, or deflects their partner’s complaints back onto the other person. Defensiveness is destructive because it escalates tension and creates an adversarial interaction. Stonewalling usually occurs as a result of escalating criticism, contempt and defensiveness as emotional overload becomes intense. Spouses who stonewall stubbornly refuse to give any verbal or nonverbal feedback that they are listening or attending to what their partner is saying. Often they just get up and leave the room. It's like talking to a stone wall. Stonewalling is best seen as a containment strategy that spouses use to avoid further escalation of the conflict. The problem is that the stonewaller does not just avoid the fight, but avoids his spouse and the relationship as well. According to John Gottman's research, 85% of stonewallers are men. Normally, when you encounter a stressful and threatening situation, your body reacts in a way that helps you to deal with the danger. Your body temporarily shuts down non-essential systems, channels blood flow to your large muscles, creates extra fuel for energy, heightens your sensitivity to signs of danger and releases hormones that help you deal with stress. Normally, this "fight-or-flight" response works well when we have to fight off an attacker, escape from a burning house, or perform a miraculous feat of strength. The problem is that it also impairs our ability to process information and to think clearly before we speak—exactly the abilities we need to have in order to work through difficult areas of disagreement with our spouse. John Gottman has a vivid word for this physiological "fight-or-flight" reaction. He calls it "flooding." Flooding occurs when you and your spouse get into hostile arguments where the Four Horseman (criticism, contempt, defensiveness, and stonewalling) are allowed free reign in your relationship. Physical signs of flooding include rapid heart rate (above 100BPM), high blood pressure, sweating, and the overwhelming urge to leave or to say something hurtful. When we become flooded, we operate mainly from a self-preservation mindset. We seek mainly to protect ourselves from the turmoil of an escalating argument, either by becoming aggressive (verbally or physically) or by trying to get away. In distressed marriages, we commonly find habitual harsh startups by the wife combined with frequent flooding and subsequent stonewalling by the husband. This common pattern leads to a vicious communication cycle where one partner repeatedly complains, nags, criticizes and blames her spouse, while the other person repeatedly avoids, withdraws, stonewalls, or dismisses his partner. The withdrawn spouse might initially respond by counterattacking or by being defensive but eventually he switches to withdrawal in order to avoid being overwhelmed. It becomes a cycle because the more the husband withdraws and avoids his wife, the more frustrated and resentful she becomes. Eventually the resentment comes out as criticism and blame, which leaves her husband feeling unappreciated and overwhelmed, and so he avoids her more, so her resentment continues to build, and on it goes. Sometimes the pattern is reversed and it is the wife who withdraws and the husband who pursues. This vicious cycle is maintained by each spouse's reaction to the other person, and by their respective fear-based focus on self-preservation. It is important to note that their reactions, on a core level, are really attempted solutions to difficult situations; but each person's "solution" fuels the flames instead of extinguishing them. Repair attempts are efforts to de-escalate conflict and avoid flooding. Repair attempts are words, phrases, or responses intended to soften the conflict, to get things back on track, to start over, or to acknowledge or recognize the other person's view. For example, "I'm sorry," or "I see your point," or "Please don't raise your voice with me," or "Maybe we can compromise," or "That's not what I meant." According to Gottman's research, couples in distressed marriages actually make more repair attempts than do happy couples. The problem is that these repair attempts repeatedly fail. Distressed couples are often so ruled by negative intentions and the desire to protect themselves or to hurt the other person, that they either ignore or do not recognize each other's repair attempts. In happy marriages, spouses make fewer repair attempts, but that is because the ones they do make are received. They work. When couples stop responding to each other's attempts to de-escalate the conflict, when they use the Four Horseman on a habitual basis, when they become frequently flooded, until one or both partners withdraw without resolution of the conflict, then the marriage will become a source of pain and torment rather than comfort and support. Where repair attempts are repeatedly failing, and the Four Horseman are habitually present, Gottman found that over 90% of couples will eventually divorce. What determines whether repair attempts will succeed or fail? The strength of the marital friendship and how positively each partner feels about the other. This is why it is so important to focus on building friendship, positive sentiment and goodwill toward each other. Friendship, goodwill and fondness become the foundation for effectively using communication and conflict resolution skills. If you have been married for some time and you recognize some of these signs in your own relationship, don't be discouraged. As long as you are willing to make conscious efforts and you are committed to your relationship these negative patterns can be reversed. If you are fairly new as a couple, start now to build mutual respect and goodwill into your relationship and learn how to protect your relationship from these corrosive behaviors ever taking hold in the first place. Time and space don't permit a full discussion about how to turn things around, but let me offer a brief summary of principles that can stop or help prevent these negative communication behaviors from consuming your relationship. Some of these principles are inspired by Gottman's work mixed in with my own clinical experience. When you raise an issue, approach your spouse softly, respectfully. Let your choice of words be guided by an attitude of friendship and respect. Remember that this is your life partner. Think about the things you love and respect about this person. If you habitually treated a friend of yours in a mean-spirited or aggressive way how long would that person stay your friend? Let your partner influence you. Learn to open space for your spouse's ideas, feelings and perspectives to arise as real and valid. Try to be responsive to your partner's requests. Adopt the policy of never saying "no", outright, to your partner's needs. If you can't accomodate a request, then negotiate alternatives or other options. Act with positive intentions to create understanding, to show respect, and to find win-win solutions, instead of acting on your immediate, negative intentions and fears. Use your positive intentions to make and receive repair attempts. Learn how to self-soothe and soothe your partner through appropriate time-outs and self-reflection. Sometimes this is a necessary step in order to re-align your intentions with positive goals and to calm down enough to think about what the real issues are for you. Pinpoint the real issues that fuel the conflict. These are underlying needs, dreams and goals and sometimes the fears related to your needs, dreams and goals. Don't get sidetracked by arguing about details such as what your spouse said three months ago. If you are not sure what your spouse's underlying issue is, ask. Be curious. Not recognizing these underlying issues will often keep couples stuck in gridlock. Learn the art of compromise. Adopt a mindset that each of you have dreams and interests that need to be honored. You can find creative win-win solutions if you stop allowing your fear to be your dominant motivator. I know what some people might be thinking: "I'm not afraid. I'm just mad." But if you really stop and think about it, fear is usually at the root of what keeps people from moving out of their polarized positions—fear of losing face, fear of losing self, fear of beng used, fear of getting hurt, etc. Learn to accept your differences and not be threatened by them. A good deal of your conflicts may arise because of how you view your differences. Conflicts rooted in personality and life experiences are not likely to go away anytime soon. It is best to learn to accept each other and focus on positives and strengths than to be pre-occupied over annoying habits or dissimilar interests. Make requests instead of demands. Requests are respectful and open the floor for discussion. Demands will usually just intensify a power struggle. Begin to recognize the vicious cycle that you both co-create and take ownership of your part in that cycle. Change the cycle by interrupting it, that is, by not giving your usual response, or by stepping back and doing something different. Often this is the very opposite of what you feel like doing in the moment. If you would like more information, the following is a list of books and recommended reading that you might find useful. This book is the culmination of decades of research. It's about building friendship, enhancing love, cultivating warmth and mutual respect, and learning to handle conflict without damaging the relationship. Well-written and relevant with lots of very practical exercises and quizzes. Watch for a new edition coming out this May. 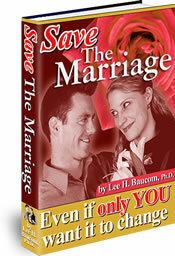 For over 15 years Dr. Lee Baucom has offered this well-written and helpful e-book for couples seeking to transform their marriage, even when only one person wants to work on it. Downloadable to your computer in ten minutes this is an excellent resource to help you shift the momentum in your relationship. If you would like to talk with one of our counsellors in person about the topic of this article, it is very easy to book an appointment by calling (403) 255-8577 or using our easy online scheduler here. We are currently accepting new clients and warmly welcome self-referrals and referrals from physicians and other professionals. External Content and Diagnosis Disclaimer: Cobb & Associates Inc. gives no direct or implied assurance that the content on an any external websites listed on this page is 100% accurate or credible. This determination must be made by individual consumers of online information. In addition, the information on this page is intended for educational purposes only and is not meant to be used for diagnosis or treatment. If you suspect that you are experiencing the type of difficulties described in this article, we strongly advise that you consult with a health professional. Affiliate Disclaimer: Some of the links to resources listed on this site are affiliate links, including the resource listed on this page. This means that if you click on a link pointing to a vendor on this page and you subsequently purchase any product from that vendor, Cobb & Associates Inc. will receive a percentage of that sale. Please know that we will only review and recommend products that we feel are of high quality and value to the reader. If any product we find on the internet is not of high quality it will not be reviewed on this site. Cobb & Associates was not offered this product for free in exchange for a review. Affiliate commissions are one method we use to offset marketing costs and are not a significant source of income for Cobb & Associates.